Driscoll bridge/evans crosswalk - We plan to expand the driscoll bridge to the east all the way to the evans crosswalk. The Expanded bridge would serve as a footbridge as well as an outdoor community space that would link the north and south halfs of campus. A designated bike lane will be added to the pathway to allow for a smooth traffic flow. the south end of the bridge incorporates an expansion of the driscoll south building. 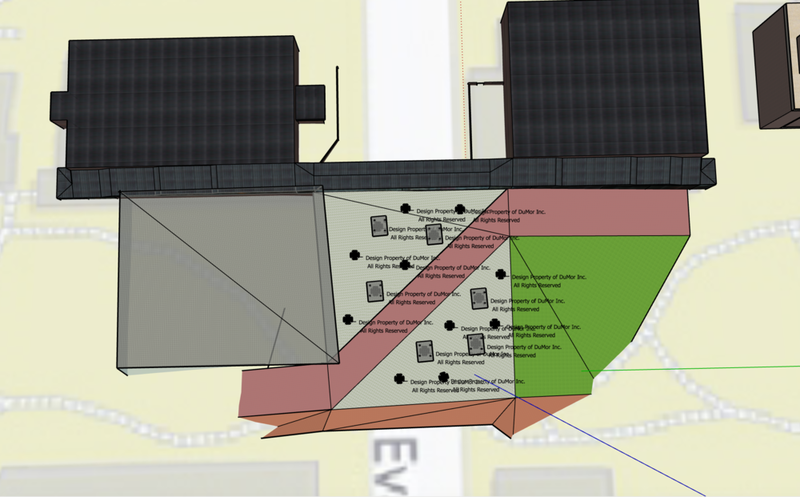 This space would include expanded community space on the ground level and a space for sustainable dining options on the second floor that connects to the top of the bridge. The North side of the bridge would be home to a grassy hillside that connects to driscoll green. This space is intended to be a flexible use space that can be used as an outdoor amphitheater, classroom, or gathering space. The top of the bridge Will house the main gathering space that will include patio tables and chairs. Six of the tables will be covered with "solar cabanas" that will provide shade but also power The Power outlets that the tables are equipped with. THe New building will incorporate multiple aspects of environmental sustainability including a roof made of photovoltaic panels, an entirely glass exterior (passive solar heating and almost exclusively natural lighting during the day). The bridge level Dining options would utilize exclusively sustainable food and beverage options. The panels on the south building will offset roughly 700,000 kWh of energy in a year. The ground floor of this building would serve as a flexible space that would allow for various gatherings such as club meetings, art installations, and other various events. This expansion of student space would be incredibly beneficial considering how little space in the existing student center is readily accessible for student use. THe dining space on the second floor will also host an indoor common area accessible to the du community. The top of the bridge will be made of grass pavers that allow grass to grow in small pockets. A low water/low maintenance grass will be used in the pavers. The tables, chairs, and benches will be made from reclaimed materials. A portion of the tables will have shade structures with photovoltaic roofs that are used to offset the power consumption of the structure.the space on the top of the bridge can also serve as a space for a community test garden for low water, native plants as well as sustainable agriculture. A large portion of the bridge can still be devoted to community space if this test garden is established. The elimination of the evans crosswalk will offset nearly seven gallons of gas burned per day and 140 pound of Carbon dioxide emissions per year just idling at the stop light. The additional gathering space on the top of the structure will add to the indoor gathering space of the attached building. The GRassy hill on the North end of the bridge will also serve as a space for building community. THe bridge itself will be primarily constructed of concrete. The main Pathway that spans the entire bridge will be made of the same red brick that all of DU's pathways are made of. Grass pavers and low water/low maintenance grass wIll cover the other surfaces of the bridge. The decorative metal facade on the east face of the bridge will be made of copper in order to promote the architectural continuity of the structure and other DU buildings. Any wooden elements will be sourced responsibly using either reclaimed or sustainably forested wood.